Kenneth L. Heck, Jr., Ph.D. The Dauphin Island Sea Lab’s (DISL) mission encompasses the pursuit of excellence in marine science education, marine research, coastal zone management policy and educating the general public through the Estuarium, our public aquarium. The Dauphin Island Sea Lab was founded in 1971 by the Alabama legislature to provide marine science programs for many of the state’s colleges and universities. Today, 23 member institutions partner with the Dauphin Island Sea Lab to provide studies to undergraduate and graduate students. Since 1971, the DISL mission has expanded to include K-12 education, professional development, and a public aquarium. The Alabama Marine Environmental Sciences Consortium (MESC) is comprised of 23 public and private colleges and universities. The Presidents of each school make up the MESC Board of Directors. The Program Committee members consist of one faculty member, appointed by the President, from each of the member institutions. The Dauphin Island Sea Lab Foundation (DISLF) supports the Dauphin Island Sea Lab in its mission, “to provide wise stewardship of the marine environment through education and research”. The DISLF provides funds to sustain the activities and programs of the Dauphin Island Sea Lab. The foundation is also continuing to build the George C. Crozier Endowment, as well as the DISLF Endowment for the Dauphin Island Sea Lab. The mission of the Mobile Bay NEP is to promote wise stewardship of the water quality characteristics and living resource base of the Mobile Bay estuarine system. Administered through and funded by the EPA under provisions of the Clean Water Act (CWA) of 1987, the initial task for the MBNEP was the development of a Comprehensive Conservation Management Plan (CCMP) as a blueprint for conserving the estuary. Discovery Hall Programs marine education programs include K-12 students, teacher training/ enhancement programs, and public outreach. It promotes conservation through education, research, and outreach. The K-12 School Year Programs are available through Discovery Hall Programs. These programs are available September through May, and are by reservation only. The Discovery Hall Programs offer a variety of programs for your children during the summer, ranging from single-day programs to residential camps and academic courses. Discovery Hall Programs strives to provide current and relevant continuing education opportunities for teachers and informal educators through hands-on workshops. Discovery Hall Programs has developed a variety of activities focused ROVs, to take advantage of K-12 students’ interest in robotics, marine biology and oceanography. 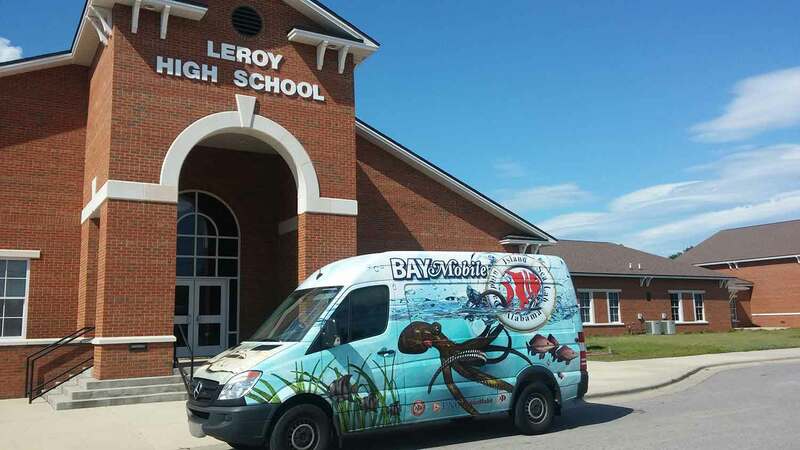 The BayMobile is DISL’s science classroom on wheels, whose mission is to visit underserved schools in the state of Alabama which do not have the opportunity or the means to visit the Dauphin Island Sea Lab on a field trip. University programs at DISL consists of two parts: our Summer Undergraduate programs and our year round Graduate Programs. While the DISL serves as the focal point of graduate education in marine science in the state of Alabama, it is not a degree-granting institution, and graduate degrees are offered through ten of the 22 DISL Member Schools. Over three sessions DISL offers over 25 marine science courses of varying amounts of credits for undergraduate students. The focus of the REU Program is to provide participants with the opportunity to carry out an independent research project while working under the direction of a faculty mentor. University Programs hosts a seminar series throughout the year on campus. The Sea Lab faculty invite researches from around the world to speak about their work. The majority of seminars are streamed live and archived on The Sea Lab’s YouTube channel. 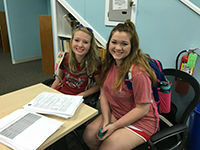 See what you can expect when you come to the Dauphin Island Sea Lab for Graduate and Undergraduate coursework. Since 1971, The Sea Lab at Dauphin Island team has collected valuable environmental and ecosystem level data as part of research and monitoring efforts in the fields of oceanography and ecology. These data are valuable to researchers, educators, managers, policymakers, and the general public. MyMobileBay.com is freely accessible by the public with ten sites monitoring the water quality. The information is updated every half hour and is gathered from eight water quality sampling stations that are located around coastal Alabama, including a new site off-shore. Since 1971, research personnel at the Dauphin Island Sea Lab (DISL) have collected valuable environmental and ecosystem level data as part of research and monitoring endeavors. The Dauphin Island Sea Lab (DISL) has been a practicing member of American Academy of Underwater Science since 1992 and currently provides scientific diver training and oversight for all participating schools within the Marine Environmental Sciences Consortium (MESC). A Gulf of Mexico Research Initiative consortia led by the Dauphin Island Sea Lab, the Alabama Center of Ecological Resilience (ACER) investigates how biodiversity influences an ecosystem’s resilience. Specifically, the ecosystems of the northern Gulf of Mexico to the 2010 Deepwater Horizon oil spill. The Sea Lab at Dauphin Island’s digital library gives the public access to more than 200 publications authored by faculty, staff, and students dating back to 1974. Find all the information you need to make the most of your visit in our public aquarium. Hours, Pricing and even our live streaming webcams can be found here! 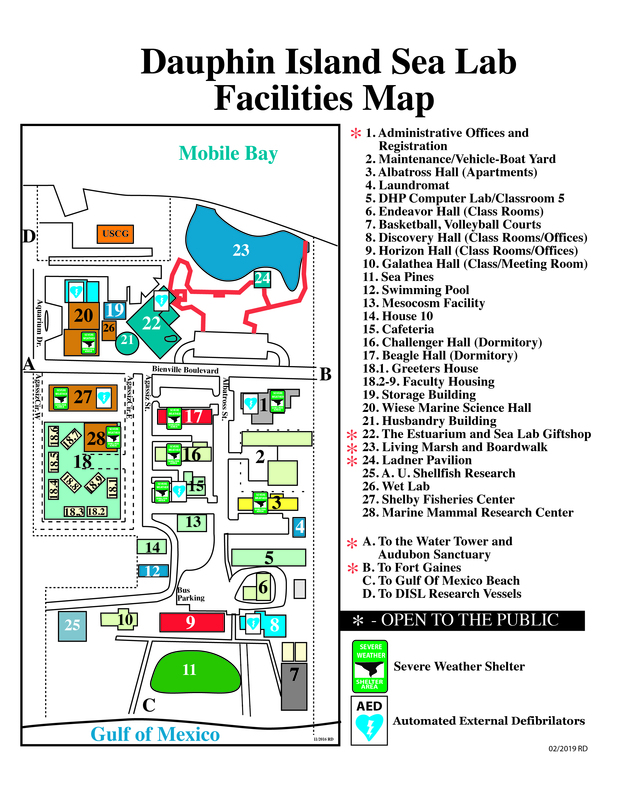 The Estuarium at the Dauphin Island Sea Lab hosts a number of events for the public. The free, twice-monthly Boardwalk Talk program offers the public a chance to engage with the experts at the Dauphin Island Sea Lab. The Summer Excursion program takes visitors into the habitats studied by our marine scientists, researchers and students at the Dauphin Island Sea Lab. Shop our online gift shop for apparel and more. Make your next function a memorable event for you and your guests at this beautiful and unique location. Join the Friends of the Sea Lab and you will receive the opportunity to the visit the Estuarium year round for just your yearly membership fee. There are many other amazing perks as well! Discovery Day is the Dauphin Island Sea Lab’s open house for the public. Once a year, the public is given a tour of our research facilities to learn about our coastal environment and the research our team is working on. 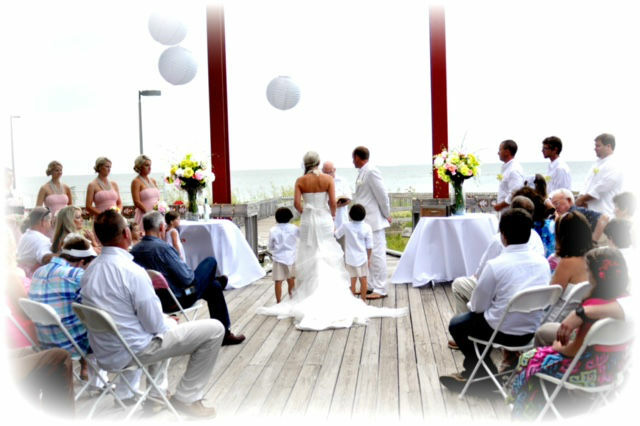 The Sea Lab at Dauphin Island is the perfect place to host your next meeting, wedding, or birthday party. Let our special events team guide you to creating a memorable experience for you and your guests. Discover an authentic Gulf Coast experience at The Dauphin Island Sea Lab. Our 5 unique venues combine on-point technology and amenities to keep you focused. 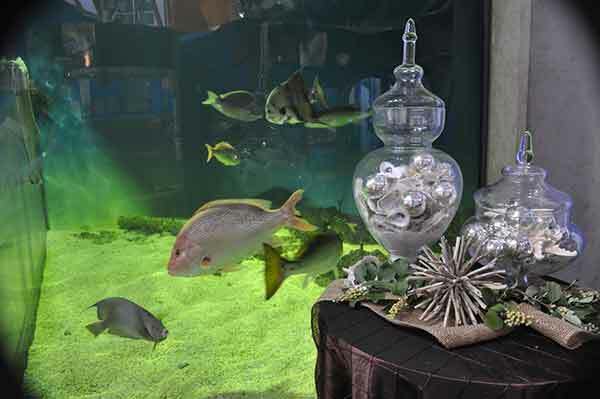 From inviting breezes on the open decks to the unmatched visual exhibits of the fourth largest estuary system in the United States, the Estuarium at The Sea Lab is the perfect venue for your indoor or outdoor functions. Climb aboard the Miss May May, and set sail for a birthday destination to remember. Both entertaining and educational, the adjacent aquatic and hands-on exhibits inside the Estuarium provide hours of excitement while guiding your child through a journey of our precious coastal habitat. Join us on September 27 and 28, 2019! The ArtSeaLab Festival is a collaboration between the area’s arts community and The Sea Lab. The weekend was created to enhance the public’s understanding of the ecological challenges facing the northern Gulf of Mexico and its coastline through the dialogs of art and science. Event schedule to come soon. ​T-shirts, sweaters, logo merchandise, and more are just a click away. 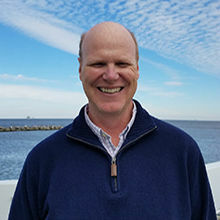 Dr. John Lehrter is an Associate Professor in the Department of Marine Sciences at the University of South Alabama and a Senior Marine Scientist at the Dauphin Island Sea Lab. Prior to joining the faculty at USA and DISL in August 2016, Dr. Lehrter was a Research Ecologist with the EPA Office of Research and Development. His research focuses on understanding the biogeochemical cycling of nutrients, organic matter, and oxygen in coastal systems and how these cycles are related to water quality issues such as eutrophication, hypoxia, coastal acidification, and water clarity. The research is largely aimed at solving complex coastal resource management issues through applications of field and lab studies, satellite oceanography, and numerical ecosystem modeling. Dr. Lehrter has served on local and national science committees and has won numerous awards for applying science to decision-making activities. He received his Ph.D. in Biology from the University of Alabama and post-doctoral training at the EPA Gulf Ecology Division. My research focuses on eutrophication, hypoxia, and the biogeochemical cycling of carbon, oxygen, and nutrients in aquatic and marine ecosystems. Specifically, I aim to understand these processes in the context of anthropogenic changes occurring at local, regional, and global scales. For a complete list publications, please visit Lehrter's Google Scholar site. Estuaries and coastal ecosystems located at the land-sea interface are among the most highly productive systems on Earth and due their proximity to land are also among the most susceptible to human activities. Therefore, the impacts to these systems are of great societal concern. Work in our lab focuses on land-use change, nutrient pollution, eutrophication, and hypoxia as primary stressors. We have hypothesized that these stressors along with a myriad of other stressors such as, ocean acidification, increasing sea surface temperatures, alterations in watershed hydrology, and harvesting of natural resources have combined to impact habitats and their supported flora and fauna. Our research aims to disentangle and quantify how these stressors manifest both individually and cumulatively in coastal systems, and to predict how the systems may change following management or restoration activities. Le C, Lehrter JC, Schaeffer B, Hu C, MacIntyre H, Hagy JD, Beddick DL. 2015. Relation between inherent optical properties and land use and land cover across Gulf Coast estuaries. Limnology and Oceanography 60:920-933. Cai W-J, Hu X, Huang W-J, Murrell MC, Lehrter JC, Lohrenz SE, Chou W-C, Zhai W, Hollibaugh JT, Wang Y, Zhao P, Guo X, Gunderson K, Dai M, Gong G-C. 2011. Acidification of subsurface coastal waters enhanced by eutrophication. Nature Geoscience 4:766-770. Oliver LM, Lehrter JC, Fisher WS. 2011. Relating landscape development intensity to coral reef condition in the watersheds of St. Croix, US Virgin Islands. Marine Ecology Progress Series 427:293-302. Lehrter JC. 2008. Regulation of eutrophication susceptibility in oligohaline regions of a northern Gulf of Mexico estuary, Mobile Bay, Alabama. Marine Pollution Bulletin 56:1446-1460. To understand coastal ecosystems, it is necessary to quantify the budgets, i.e. the stocks and rates of change, of important elements such as carbon, oxygen, nitrogen, and phosphorus. Our observational studies seek to quantify and predict how these material budgets are impacted by anthropogenic stressors such as land-use change, increased nutrient loading, and climate change. Often, though, it is not possible to isolate how individual or cumulative stress affects an ecosystem through observation alone. In such cases, we employ numerical ecosystem models to tease apart the complexity that cannot be observed directly. Ecosystem models are also useful for data synthesis and identification of knowledge gaps in our understanding of specific processes, which can lead to new hypotheses about how marine systems are organized and operate. We have developed and applied models ranging from coastal watershed hydrologic and nutrient exports models to coastal three-dimensional hydrodynamic and biogeochemical models to understand and predict how local and global anthropogenic perturbations impact coastal systems. Our present work includes testing and inter-comparison of hypoxia models and development of new biogeochemical models to incorporate current scientific understanding of underlying processes such as controls on phytoplankton community dynamics and the fate of their produced organic matter in the water-column and benthos. Lehrter JC, Ko DS, Lowe L, Penta B. Predicted effects of climate change on northern Gulf of Mexico hypoxia. In: Justic D, Rose KA, Hetland RD, Fennel K (eds.). Modeling Coastal Hypoxia: Numerical simulations of Patterns, Controls, and Effect of Dissolved Oxygen Dynamics. Springer, New York (Accepted). Lehrter JC, Ko DS, Murrell MC, Hagy JD, Schaeffer BA, Greene RM, Gould RW, and Penta B. 2013. Nutrient distributions, transport pathways, and fate on the inner margin of a river-dominated continental shelf. Journal of Geophysical Research: Oceans 118:1-17. Lehrter JC, Beddick DL, Jr., Devereux R., Yates DF, Murrell MC. 2012. Sediment-water fluxes of dissolved inorganic carbon, O2, nutrients, and N2 from the hypoxic region of the Louisiana continental shelf. Biogeochemistry 109:233-252. Lehrter JC, Cebrian J. 2010. Uncertainty propagation in an ecosystem nutrient budget. Ecological Applications 20:508-524. There has been a revolution over the past decade in the use of satellite ocean color data to better understand spatial and temporal dynamics of marine systems. Current satellites provide global, spatially synoptic, coastal data on a daily frequency. Our work revolves around developing new algorithms to retrieve water quality data from satellites in optically complex coastal systems and in the application of these data to develop water quality time-series that can be analyzed to determine the main factors, human vs natural, that drive variability in water quality. Le C, Lehrter JC, Schaeffer BA, Hu C, Murrell MC, Hagy JD, Greene RM, Beck M. 2016. Bio-optical water quality dynamics observed from MERIS in Pensacola Bay, Florida. Estuarine, Coastal and Shelf Science, doi: 10.1016/j.ecss.2016.02.003. Le C, Lehrter JC, Hu C, Obenour D. 2016. Satellite-based empirical models linking river plume dynamics with hypoxic area and volume. Geophysical Research Letters, doi: 10.1002/2015GL067521. Barnes BB, Hu C, Schaeffer BA, Lee Z, Palandro DA, Lehrter JC. 2013. MODIS-derived spatiotemporal water clarity patterns in optically shallow Florida Keys water: A new approach to remove bottom contamination. Remote Sensing of Environment 134:377-391. Schaeffer BA, Hagy JD, Conmy RN, Lehrter JC, Stumpf R. 2012. An approach for developing nutrient-related numeric water quality criteria for coastal waters using SeaWiFS satellite remote sensing data. Environmental Science and Technology 46:916-922. Laurent, A., K. Fennel, D.S. Ko, and J. Lehrter. Climate Change Projected to Exacerbate Impacts of Coastal Eutrophication in the Northern Gulf of Mexico Journal of Geophysical Research: Oceans 123 (5), 3408 -3426. doi.org/10.1002/2017JC013583. Lehrter, J.C., D. S. Ko, L. L. Lowe, and B. Penta. Predicted Effects of Climate Change on Northern Gulf of Mexico Hypoxia Modeling Coastal Hypoxia, Pages 173-214. Le, C., J. C. Lehrter, C. Hu, H. MacIntyre, and M. W. Beck. Satellite observation of particulate organic carbon dynamics on the Louisiana continental shelf. Journal of Geophysical Research: Oceans, Volume 122, Issue 1, Pages 555-569. Conmy, R.N., B. A. Schaeffer, J. Schubauer-Berigan, J. Aukamp, A. Duffy, J. C. Lehrter, and R.M. Greene. Characterizing light attenuation within Northwest Florida Estuaries: implications for RESTORE Act water quality monitoring. Marine Pollution Bulletin, Volume 114, Issue 2, Pages 995-1006. Laurent, A., K. Fennel, R. Wilson, J.C. Lehrter, and R. Devereux.. Parameterization of biogeochemical sediment-water fluxes using in situ measurements and a diagenetic model. Biogeosciences. Volume 13, Issue 1, Pages 77. Ko, D.S., R. W. Gould, B. Penta, J. C. Lehrter. Impact of satellite remote sensing data on simulations of coastal circulation and hypoxia on the Louisiana Continental Shelf. Remote Sensing, Volume 8, Issue 5, Pages 435. Fennel, K., A. Laurent, R. Hetland, D. Justić, D. D. Ko, J. C. Lehrter, M. Murrell, L. Wang, L. Yu, and W. Zhang. Effects of model physics on hypoxia simulations for the northern Gulf of Mexico: A model intercomparison. Journal of Geophysical Research: Oceans, Volume 121, Issue 8, Pages 5731-5750. Le, C., J. C. Lehrter, B. A. Schaeffer, C. Hu, M. C. Murrell, J. D. Hagy, R. M. Greene, and M. Beck. Bio-optical water quality dynamics observed from MERIS in Pensacola Bay, Florida. Estuarine, Coastal and Shelf Science, Volume 173, Pages 26-38. Feist, T. J., J. J. Pauer, W. Melendez, J. C. Lehrter, P. A. DePetro, K. R. Rygwelski, D. S. Ko, and R. G. Kreis, Jr. Modeling the relative importance of nutrient and carbon loads, boundary fluxes, and sediment fluxes on Gulf of Mexico hypoxia. Environmental science & technology. Volume 50, Issue 16. Pages 8713-8721. Le, C., J. C. Lehrter, C. Hu, and D. R. Obenour.. Satellite‐based empirical models linking river plume dynamics with hypoxic area and volume. Geophysical Research Letters, Volume 43, Issue 6, Pages 2693-2699. Pauer, J.J., T. J. Feist, A. M. Anstead, P. A. DePetro, W. Melendez, J. C. Lehrter, M. C. Murrell, X. Zhang, and D. S. Ko. A modeling study examining the impact of nutrient boundaries on primary production on the Louisiana continental shelf. Ecological Modelling, Volume 328, Pages 136-147. Le, C., J. C. Lehrter, C. Hu, B. Schaeffer, H. MacIntyre, J. D. Hagy, and D. L. Beddick. Relation between inherent optical properties and land use and land cover across Gulf Coast estuaries. Limnology and Oceanography, Volume 60, Issue 3, Pages 920-933. Fry, B., D. Justić, P. Riekenberg, E. M. Swenson, R. E. Turner, L. Wang, L. Pride, N. N. Rabalais, J. C. Kurtz, J. C. Lehrter, M. C. Murrell, E. H. Shadwick, and B. Boyd. Carbon dynamics on the Louisiana continental shelf and cross-shelf feeding of hypoxia. Estuaries and coasts, Volume 38, Issue 3, Pages 703-721. Devereux, R., J. C. Lehrter, D. L. Beddick, D. F. Yates, and B. M. Jarvis. Manganese, iron, and sulfur cycling in Louisiana continental shelf sediments. Continental Shelf Research, Volume 99, Pages 46-56. Yu, L., K. Fennel, A. Laurent, M. C. Murrell, and J. C. Lehrter. Numerical analysis of the primary processes controlling oxygen dynamics on the Louisiana shelf. Biogeosciences, 12, 2063-2076. Hill, B.H., C. M. Elonen, L. E. Anderson, and J. C. Lehrter. Microbial respiration and ecoenzyme activity in sediments from the Gulf of Mexico hypoxic zone. Aquatic Microbial Ecology, Volume 72, Issue 2, Pages 105-116. Barnes, B. B., C. Hu, J. P. Cannizzaro, S. E. Craig, P. Hallock, D. L. Jones, J. C. Lehrter, N. Melo, B. A. Schaeffer, and R. Zepp. Estimation of diffuse attenuation of ultraviolet light in optically shallow Florida Keys waters from MODIS measurements. Remote Sensing of Environment, Volume 140, Pages 519-532. Pauer, J.J., P. A. DePetro, A. M. Anstead, and J.C. Lehrter.. Application of a one-dimensional model to explore the drivers and lability of carbon in the northern Gulf of Mexico. Ecological Modelling, Volume 294, Pages 59-70. Le, C., J. C. Lehrter, C. Hu, M. C. Murrell, and L. Qi. Spatiotemporal chlorophyll‐a dynamics on the Louisiana continental shelf derived from a dual satellite imagery algorithm. Journal of Geophysical Research: Oceans, Volume 119, Issue 11, Pages 7449-7462. Lehrter, J.C., B. Fry, and M. C. Murrell. Microphytobenthos production potential and contribution to bottom layer oxygen dynamics on the inner Louisiana continental shelf. Bulletin of Marine Science, Volume 90, Issue 3, Pages 765-780. Genthner, F.J., D.T. Marcovich, and J. C. Lehrter.. Estimating Rates of Denitrification Enzyme Activity in Wetland Soils with Direct Simultaneous Quantification of Nitrogen and Nitrous Oxide by Membrane Inlet Mass Spectrometry. Microbial & Biochemical Technology, Volume 5, Issue 4, Pages 95-101. Lehrter, J. C., D. S. Ko, M. C. Murrell, J. D. Hagy, B. A. Schaeffer, R. M. Greene, R. W. Gould, and B. Penta. Nutrient distributions, transports, and budgets on the inner margin of a river‐dominated continental shelf. Journal of Geophysical Research: Oceans, Volume 118, Issue 10, Pages 4822–4838. Pauer, J.J., T.J. Feist, W. Melendez, X. Zhang, and J.C. Lehrter. Stormwater Runoff Loadings To Coastal Bayous Under A Gradient Of Watershed Urbanization, North Central Gulf of Mexico. World Environmental and Water Resources Congress 2013: Showcasing the Future, Pages 350-366. Barnes, B.B., C. Hu, B.A. Schaeffer, Z. Lee, D.A. Palandro, and J.C. Lehrter. MODIS-derived spatiotemporal water clarity patterns in optically shallow Florida Keys waters: A new approach to remove bottom contamination. Remote Sensing of Environment, Volume 134, Pages 377-391. Murrell, M.C., R. S. Stanley, J. C. Lehrter, and J. D. Hagy. Plankton community respiration, net ecosystem metabolism, and oxygen dynamics on the Louisiana continental shelf: Implications for hypoxia. Continental Shelf Research, Volume 52, Pages 27-38. Grigas, D., J. Cebrian, B. Ehmen, M. Woodrey, T. Strange, W. Underwood, J. Lehrter and Y. Chen. Stormwater runoff loadings to coastal bayous under a gradient of watershed urbanization, North Central Gulf of Mexico. Proceedings of the World Environmental and Water Resources Congress 2013: 350 -366. Lehrter, J.C., D.L. Beddick, R. Devereux, D. F. Yates, and M.C. Murrell. Sediment-water fluxes of dissolved inorganic carbon, O2, nutrients, and N2 from the hypoxic region of the Louisiana continental shelf. Biogeochemistry, Volume 109, Issue 1–3, pp 233–252. Schaeffer, B.A., J. D. Hagy, R.N. Conmy, J.C. Lehrter, and R.P. Stumpf.. An approach to developing numeric water quality criteria for coastal waters using the SeaWiFS satellite data record. Environmental Science & Technology, 46 (2), pp 916–922. Schaeffer, B.A., G. A. Sinclair, J. C. Lehrter, M. C. Murrell, J. C. Kurtz, R. W. Gould, and D. F. Yates. An analysis of diffuse light attenuation in the northern Gulf of Mexico hypoxic zone using the SeaWiFS satellite data record. Remote Sensing of Environment, Volume 115, Issue 12, Pages 3748-3757. Cai, W.J., X. Hu, W. J. Huang, M. C. Murrell, J. C. Lehrter, S. E. Lohrenz, W. C. Chou, W. Zhai, J. T. Hollibaugh, Y. Wang, P. Zhao, X. Guo, K. Gundersen, M. Dai, and G. C. Gong.. Acidification of subsurface coastal waters enhanced by eutrophication. Nature Geoscience 4, 766-770. Oliver, L.M., J. C. Lehrter, and W.S. Fisher. Relating landscape development intensity to coral reef condition in the watersheds of St. Croix, US Virgin Islands. Marine Ecology Progress Series, Vol. 427, pp. 293-302. Murrell, M.C. and J.C. Lehrter.. Sediment and lower water column oxygen consumption in the seasonally hypoxic region of the Louisiana continental shelf. Estuaries and Coasts, Volume 34, Issue 5, pp 912–924. Greene, R.M., J. C. Lehrter, and D. H. James III.. Multiple regression models for hindcasting and forecasting midsummer hypoxia in the Gulf of Mexico. Ecological Applications, Vol. 19 Issue 5, Pages 1079–1375. Lehrter, J.C., M. C. Murrell, and J.C. Kurtz. Interactions between Mississippi River inputs, light, and phytoplankton biomass and phytoplankton production on the Louisiana continental shelf. Continental Shelf Research, Volume 29, Pages 1861-1872. Penta B., D. Ko, R. Gould, R. Arnone, R. Greene, J. C. Lehrter, J. Hagy, B. Schaeffer, M. Murrell, J. Kurtz, B. Herchenroder, R. Green, and P. Eldridge. Using coupled models to study the effects of river discharge on biogeochemical cycling and hypoxia in the northern Gulf of Mexico. OCEANS 2009, MTS/IEEE Biloxi-Marine Technology for Our Future: Global and Local Challenges, Pages 1-7. Lehrter, J.C., M.C. Murrell, and J.C. Kurtz. Interactions between freshwater input, light, and phytoplankton dynamics on the Louisiana continental shelf. Continental Shelf Research, Volume 29, Issue 15, Pages 1861-1872. Lehrter, J.C.. Regulation of eutrophication susceptibility in oligohaline regions of a northern Gulf of Mexico estuary, Mobile Bay, Alabama. Marine Pollution Bulletin, Volume 56, Issue 8, Pages 1446-1460. Hagy, J.D., J.C. Lehrter, and M.C. Murrell.. Effects of hurricane Ivan on water quality in Pensacola Bay, Florida. Estuaries and Coasts, Volume 29, Issue 6, pp 919–925. Lehrter, J.C.. Effects of land use and land cover, stream discharge, and interannual climate on the magnitude and timing of nitrogen, phosphorus, and organic carbon concentrations in three coastal plain watersheds. Water Environment Research, Volume 78, Number 12, pp. 2356-2368(13). Glibert, P. M., C. J. Madden, E. Dettmann, W. Boynton, C. Heil, W. Nelson, J. C. Lehrter, J. Latimer, D. Flemer, M. Kennish, C. Brown, and S. Bricker. A framework for developing nutrient criteria. Nutrients in Estuaries, Page 43. Carey, A.E., W. B. Lyons, J. C. Bonzongo, and J. C. Lehrter. Nitrogen budget in the Upper Mississippi River watershed. Environmental & Engineering Geoscience, Volume 7, Issue 3, Pages 251-265. Lehrter, J.C., J.R. Pennock, and G.B. McManus.. Microzooplankton grazing and nitrogen excretion across a surface estuarine-coastal interface. Estuaries and Coasts, Volume 22, Issue 1, pp 113–125. Carey, A.E., J. R. Pennock, J. C. Lehrter, W. B. Lyons, W. W. Schroeder, and J. C. Bonzongo.. The role of the Mississippi River in Gulf of Mexico hypoxia. Environmental Institute Publication, 70, 35487-0207. Lehrter, J.C.. Estuarine ecosystem metabolism and retention of allochthonous nutrient loads in three tidal river estuarine systems. p: (251) 861-2141 f: (251) 861-4646 | Designed by Optera Creative, inc."